I decided to write one final piece of text about my second participation on the contest. I already described my journey in detail here and here, and also did a dissection of the source code, but I wanted to record some lessons learned which may come in handy for other people or myself in the future. This was the second time I participated in the contest; results from last year had been a bit disappointing (regarding the ranking given by the jurors), and I knew my development time this year was going to be very limited. Still, I aimed to rank high into the lists. The theme for this year was OFFLINE, as mentioned in my first blog post, I started off with a vague idea of a space… thing… where you could collaborate with other players offline to advance through the game. And that’s precisely what I ended up doing! Interestingly, and maybe because of what I set to do and my experience from last year, I didn’t have any issues with the 13KB limit so I didn’t have to cut around any corners. I incorporated the OFFLINE theme by allowing 2 players hot-seat offline play. However, the results were even less encouraging this year. Despite receiving good feedback from the jurors, the game didn’t even end up in the top 100. (Last year it ended up #40 overall and ranked well in the Community and Social lists). Since this was the first year where some constraints were put on the prizes model (only top 100 entries would get prizes) that meant that effectively I lost the contest. There was a total of 270 entries, and mine ended up ranked #105. Unlike last year, this time I don’t really have some big factors I think led to this result. I contented myself in thinking that the jurying process is not perfect, and there may have been very good entries this year. Still, here’s what I think worked and didn’t work. Pseudo 3D Effect: Everyone loved how cool the ships looked when soaring around. Straightforward action-packed: The game is pretty responsive and quick, with lots of action on screen. No need to explain anyone how to play because it’s obvious! 2 players hot-seat mode: I couldn’t test this much because I have no friends, but I saw some people have fun and yell at each other afterward. A solid, finished entry: No bugs, no feeling of being an “incomplete game”, it is what it is and it doesn’t break. Music: One of the game highlights, and I didn’t do it myself 😀 it was all thanks to Ryan Malm. I just gave him a reference and some ideas, and he came up with the track. Thanks again! 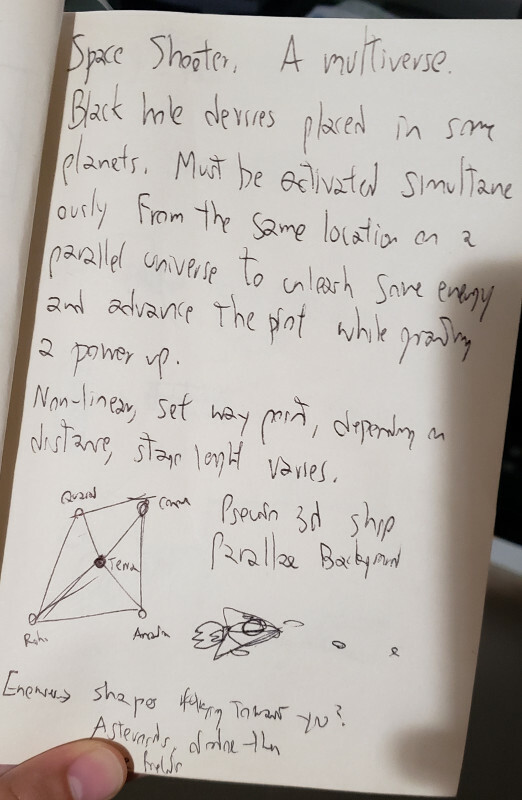 Floaty Controls: Since my foundational work on a simple physics engine had support for acceleration, I stuck to the end with the idea of the ships being “hard to control” as a “challenging aspect” for the player. I knew it was frustrating, but I waged on the players trying harder to learn how to control it. In the end, it ended up being too hard and too different to the standard. A model where the ships had less inertia would have been much more playable and enjoyable. Maybe I need to start making easier games! Balancing: Some people reported the game was a bit too hard. In part, this may be closely related to the controls, but also could have lessened the hit points of the enemies or made the difficulty curve less step. Lack of theme: Yet another space shooter, no plot, maybe went too much into the arcade direction? So that aspect was pretty uninteresting. There were also too few types of enemies, mainly because of the time constraints I had. Graphics too simple: I am not an artist, and the game had high-resolution vector art. Unlike last year where I could go around that by using shadows in the darkness, this year I went for colors and maybe it didn’t look too nice. One thing that could have worked would have been using WebGL filters to post-process the bare graphics, which has worked great for other games in the past. This is not the end of the story for Duet of Aces… I plan to make it evolve into a more complete game, keeping the core design but adding better art, sound effects, more music, a complete plot and more importantly, adapting it to social media mobile platforms. More info soon! An easy game, rewarding players without requiring lots of skill.